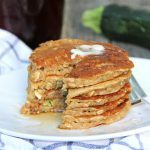 These Zucchini Bread Pancakes are a delicious way to use up any extra zucchini you have around! They’re hearty and SO good! Grate the zucchini. Then between a towel, squeeze out as much liquid as you can. Set aside. In a bowl combine the oats, flour, sugar, baking powder, baking soda, and cinnamon. In a separate bowl combine the yogurt, milk, eggs, vanilla and butter. Then add the wet ingredients to the dry. Combine. On a low to medium heat preheated griddle, scoop 1/4 cup of the batter for each pancake. Serve with syrup or a cinnamon/sugar mix. I used a small zucchini for this recipe. My thoughts on this are: the more zucchini you use, and the less you wring it out, the more mushy your pancakes will be. So the amount of zucchini you use, is up to you. If you would like them more dry, I would suggest half of a small zucchini.